Intraline One is a hyaluronic acid-based aesthetic filler that provides temporary dermal filling and lifting to treat facial wrinkles. Hyaluronic acid molecules are derived from the fermentation of bacterial cultures and are purified to be free from potentially harmful endotoxins. The molecules are then processed using Hyaluronic Acid Spherification Technology, resulting in uniformly spherical hyaluronic acid particles embedded in gel. The final product contains 20mg/ml of cross-linked hyaluronic acid that are, on average, of a medium spherical size. What is Intraline One formulated to do? The integrity and functionality of the skin are regulated by various dermal cells, such as collagen, elastin, and hyaluronic acid. These cells work together to keep the skin well-hydrated, elastic, and resistant to imperfections. However, aging brings about rapid decline in the quantity and quality of said cells, including hyaluronic acid. As a result, skin becomes prone to damages and displays signs of aging, such as wrinkles and lines. 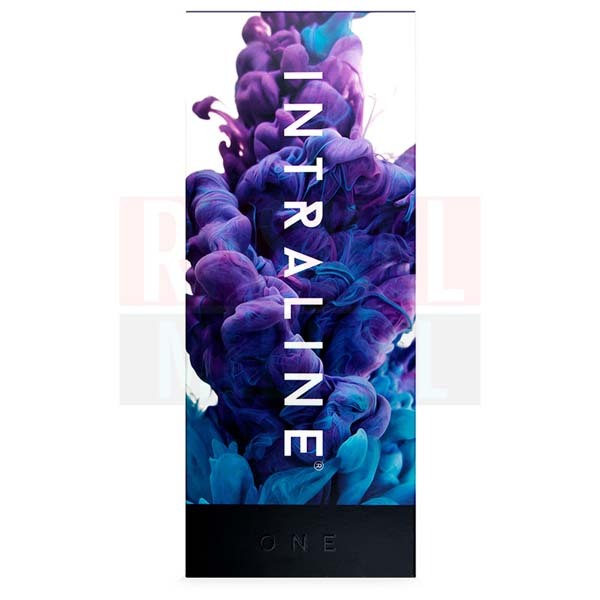 Intraline One is a viscoelastic gel made up of hyaluronic acid spheres of a medium size to effectively plump moderate facial lines, such as marionette lines, which are the lines that extend downwards from the corners of the mouth. This aesthetic filler is also perfect for sculpting patients’ lips subtly. Following Intraline One treatment, skin appears wrinkle-free and plump. The manufacturer behind this excellent aesthetic implant is Bohus BioTech AB, a Swedish biotechnology company that specializes in hyaluronic acid-based medical devices. This high-quality medical device is made in Europe. When can Intraline One cause side effects? This aesthetic implant is administered into problematic skin areas via a series of minimally invasive injections. Patients may then exhibit some inflammatory reactions caused by the injection process, such as pain, redness, and swelling. These reactions are mild in nature and tend to subside within a week or two. Tell your patients to keep the treated area(s) free from makeup and protected from harsh temperatures to shorten the recovery time. Common inflammatory reactions that do not abate within the stipulated time are considered serious and must be treated by physicians immediately. Intraline One is indicated for patients who wish to treat moderate facial, such as marionette lines. Patients who are unhappy with the shape and size of their lips can also opt for non-surgical lip augmentations using this filler. What is Intraline One made without? The hyaluronic acid gel is comprehensively purified to be free from any endotoxins and contaminants. 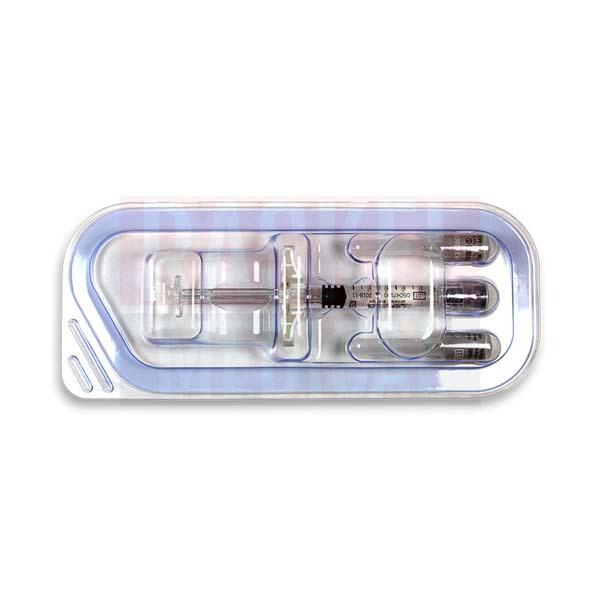 This filler is supplied in a glass syringe that contains 1ml of this product. Is Intraline One approved by FDA? As of yet, this implant has not received approval from the U.S. Food and Drug Administration (FDA) for use in erasing moderate wrinkles and volumizing lips. 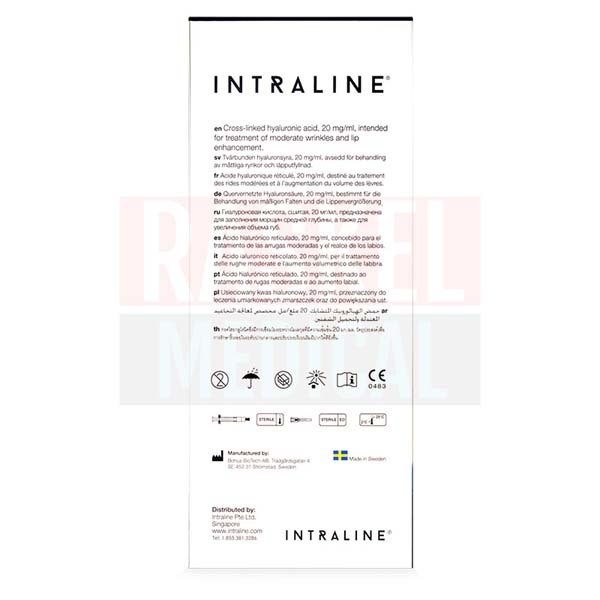 What are the differences between the products in the Intraline range? Other fillers in this range are Intraline Two and Intraline for Men. These two products differ from Intraline One in terms of their average hyaluronic acid spherical size. Indeed, both of these fillers consist of 20mg/ml of cross-linked hyaluronic acid that are, on average, of a large spherical size. What is the suggested usage of Intraline One? Aesthetic filler injections can only be conducted aseptically by certified and experienced physicians on thoroughly vetted patients. A complete medical and facial assessment will determine the best treatment goals for your patients. Just before the treatment session, clean and sanitize the proposed area(s). Assemble the medical device and administer the filler via mid-dermal injections. It is important to maintain the angle of injection at 30 to 35 degrees to the skin’s surface for optimal filler implantation. After injecting, massage the treated area(s) gently and discard any leftover filler material. Hyaluronic acid is a naturally occurring complex sugar molecule that deeply nourishes and hydrates other cells for optimal performance. This filler is made of 20mg/ml of cross-linked hyaluronic acid that is, on average, of a medium spherical size. Following extraction and purification, the molecules are reshaped via Hyaluronic Acid Spherification Technology into uniformly spherical structures. The resulting gel possesses a higher molecular density to enable smoother and natural-looking outcomes. 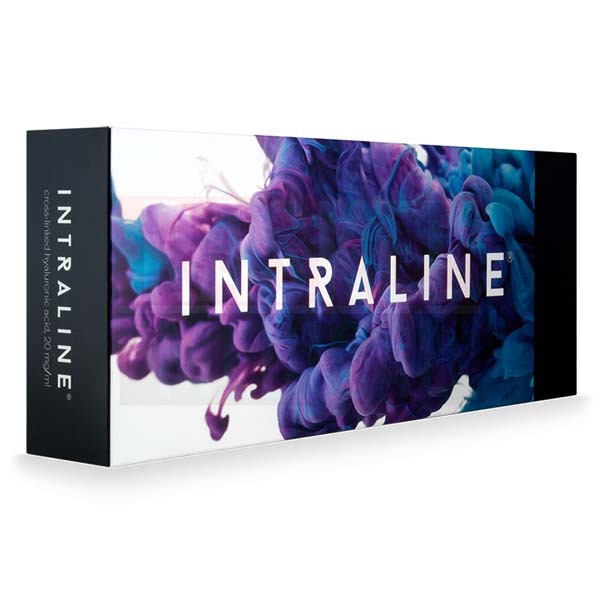 A box of Intraline One comes with one preloaded syringe that has 1ml of this product, two sterile and disposable 27-gauge needles, some labels for traceability purposes, and as package insert. This dermal implant is able to deliver plumping and sculpting effects for up to a year or more. Nevertheless, it is completely bioresorbable and will disintegrate into surrounding tissues. Please note that filler’s residence time varies on an individual basis, as patients’ ages, lifestyles, and skin condition each affect residence time. Store this product in a clean and dry room that has a temperature ranging between 2℃ to 25℃. Additionally, keep this product away from freezing conditions and direct sunlight. Like many other dermal fillers, Intraline One has a shelf life of three years.